Have you ever sat blinking at the blank screen of your computer? While the clock ticks and the Facebook updates pile up. The stars pop up in the inky blue sky, the wind gathers speed and the temperature falls a couple of degrees. The trees sway to the breeze, almost in rhythm. You are supposed to write about the World Pasta Day and how starchy pasta takes you to carb heaven and gladdens your greedy heart. But words fail you. You would rather eat the last of the pasta, lick the bowl clean and burp like a happy baby. And hear the clock tick, check inane Facebook updates, spy on unknown people, browse Pinterest and generally will away time. You wish the post wrote itself, but no such luck. You stare at luminescent blank screen while the screen stares right back at you. It's almost as if you are in a who-can-stare-whom-down contest. Of course you loose, a computer can stare longer and harder than any of us, you know. You sigh and try dragging your mind back to starchy noodles. Ah pasta, those strings/nuggets of flour/wheat covered in cheese or tomato delights. Sometimes laden with meat, sometimes seafood, you don't mind the veggie delights either. The pasta that you just had for dinner and promised yourself that you would make some more again, soon. Yes that pasta, but what to write about it? Something profound and philosophical or something witty and smart? Alas neither profound, nor witty comes to mind. Some evenings are just not meant for writing. Best thing is to accept this reality and move onto the pasta. The recipe I promised to share with you, remember? This recipe is from Mary Berry & Lucy Young's book Cook Up A Feast. Ever since I got this book at the Aga Rangemaster launch event I have been meaning to cook from it. Of course by the time I got around to it the Aga Rangemaster is four months old. I excuse my laziness on the premise that it is better late than never. The most exciting part of the Aga Rangemaster launch event apart from drooling at fabulous Agas all over the place was meeting Mary Berry. Yes she was there and gave a witty talk about her Aga experience and the long history they share. Coming back to the spaghetti recipe let me give you the list of ingredients and the step by step cooking process as laid down in the book. 1. 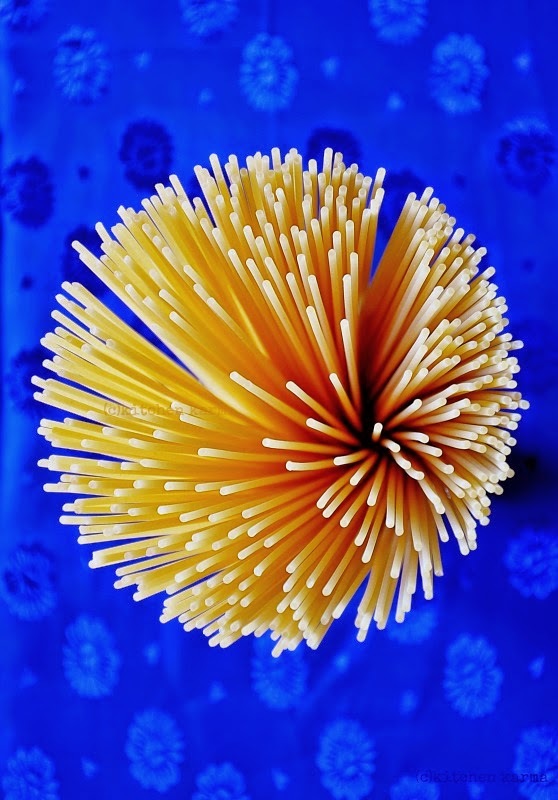 Cook the spaghetti in boiling water according to packet instruction. Drain well. 2. Heat 1 table spoon of the oil in a deep frying pan, add the breadcrumbs and lemon zest, and fry for 1 minute or until crispy. Remove with a slotted spoon and set aside. 3. Add the remaining oil to the pan, stir in the shallot, garlic and chilli and fry for 3-4 minutes or until starting to soften. 4. Stir in the prawns and tomatoes, then add the parsley and lemon juice. 5. Stir in the spaghetti, season with salt and freshly ground black pepper, and heat through throughly. Stir in the breadcrumbs and serve immediately with the Parmesan. I made fresh breadcrumbs blitzing two slices of medium toasted brown bread. There are several youtube videos on how to make fresh breadcrumbs. Most recommend adding olive oil to the breadcrumbs. But if you add olive oil to your breadcrumbs you have to use them up, cannot be stored in the fridge. So if you want to use your breadcrumb for later use, please do not add olive oil to it. For this recipe I did not since the first step of the recipe is to fry it in oil. Enjoy the spaghetti. 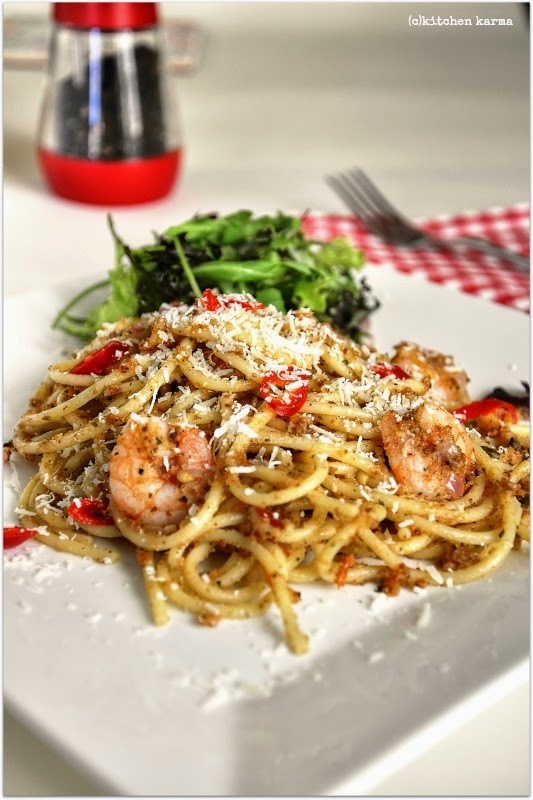 And if after enjoying this you are inspired to try out different pasta dishes visit my friend Louise's this link for 24 more recipes. I am going to save this recipe, I have not eaten schrimps for a year, I need to come back to such flavors! All I can say is, this dish was absolutely worth waiting for! Holy deliciousness!!! 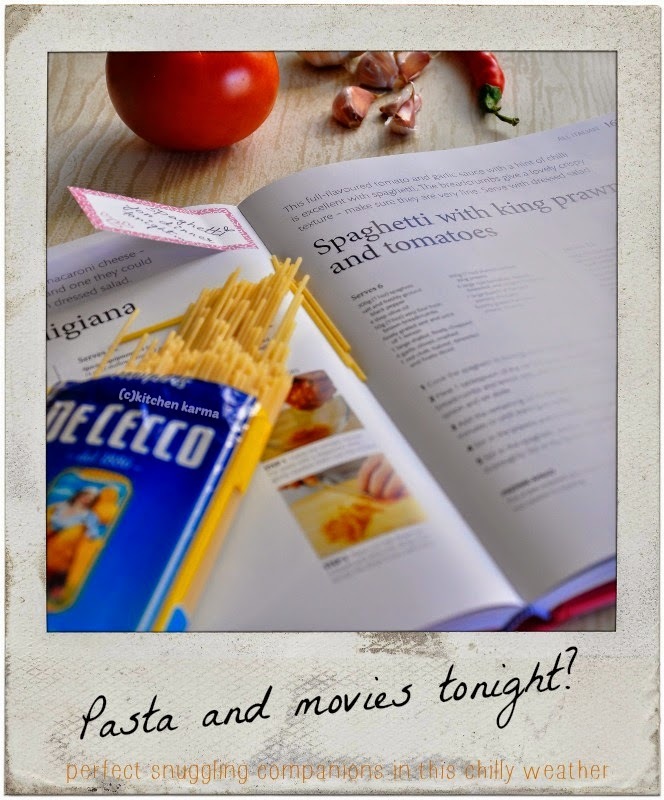 Thank you so much for sharing...Just goes to show you World Pasta Day should be every day!!! I added your delicious looking pasta dish to the Pasta Party Round-up. Thank YOU! I am going to make it for tomorrow's evening. Please kindly write for how many persons is that recipe? Hi Ola, according to the book this recipe serves 6 people! 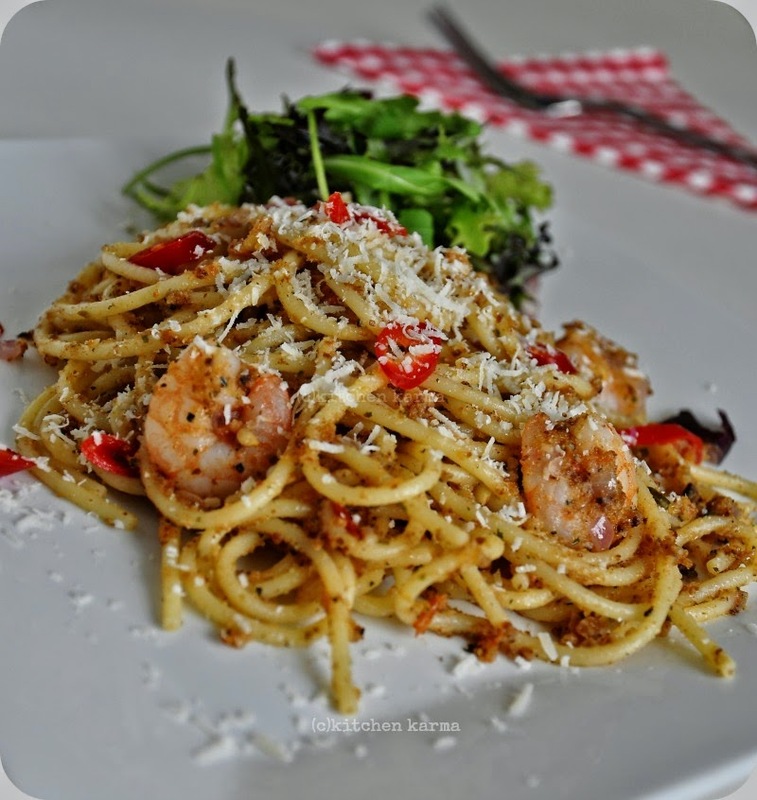 Beautiful clicks Suchi, especially the second one with just the pasta, very pretty..
Great spaghetti recipe that I want to try soon. It looks delicious! I like your blog too, great header! Spaghetti look divine; pasta is always welcome in my household! wow, i adore your photograph skills! what a comfort mongning supper, well done!